Donnie and Dave are the best! They will do everything in their power to make sure you have a fantastic time. Real professionals! 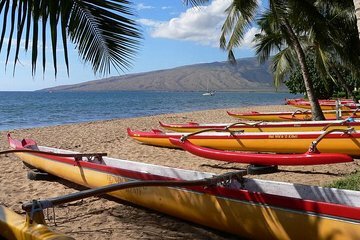 If you want to go out with real people and enjoy the waters of Maui, this is the excursion for you. The canoe is expertly maintained, you will learn lots about local culture if you are so inclined or just sit back and enjoy the sights! The snorkeling and hanging with the turtles is world class. You will not be disappointed. This adventure was one of the best we ever had in Maui (and we have had many great adventures in Maui)! It was only for a few (no more than 4 people), and the two guides were outstanding. It was the best 2 hour adventure with lots of sailing and whale watching that we have from one of the most beautiful beaches (polo beach) on Maui!....Highly recommend this excursion!! The weather was beautiful and the guides were experienced paddlers, who were supportive of my daughter, a novice snorkeler. That being said, I felt like the activity was geared more towards the guides' enjoyment than on educating us about the outrigger tradition.